I'm coming to terms with the fact that summer truly is over and that this isn't just a blip and next week won't be gloriously hot. Also long over is the Summer of Socks 2015. The challenge to knit socks in Coop Knits pattern for the chance of winning a prize sent many into a frenzy of sock knitting. Amazingly, some enthusiastic knitters completed five and even six pairs over the three months. The gallery below shows a small selection from some of the more prolific knitters. To see the rest of the dazzling array of socks, flick through the Ravelry thread. If you fancy knitting any of these for yourself, clicking on the photo will take you to the Ravelry pattern page. The yarn prize winners, picked at random, were anjalovesknits, aiko1122 and dancingsaint. The digital pattern winners, again picked at random, were saralu, gaievans, mrkernan, debbie135, gillianrtp, writergirl3, papisbaby, mazknitter and zebraeule. 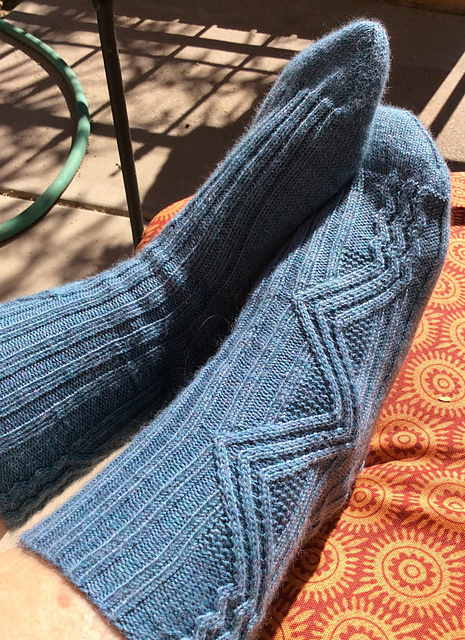 If you're having sock withdrawal, there's a KAL for the Delbert and Decca patterns running through what remains of September and October in the Coop Knits group on Ravelry. Wow! It sounds like you had a brilliant time at both Unwind and Fibre East. What treats! I'm knitting along on my Betula socks, but I have to admit that they aren't growing that fast. There's just been so much going on for the last few weeks that knitting time has been a scarce commodity. Anyway, I thought I would while away a bit of quiet time seeing what everyone else has been up to in the Summer of Socks thread. What a feast of inspiring patterns! Have you been looking at them? CelticCastOn's Pavilion Socks knitted in Wandering Cat Yarns Alley Cat BFL. These Pavilion Socks knitted by CelticCastOn look cool, calm and inviting. HotCheese's Pavilions are in my favourite go-to shade of green and give the design a more zingy feel. And then HotCheese has used this amazing shade of green for her Pavilion socks, which makes them look completely different! I can almost feel myself falling down a rabbit hole of yarn enablement as a browse the projects! Rachel, we'd best neither of us look at that Plucky Knitter Plucky Feet in Lounge Lizard that HotCheese has used! Stunning! There are some great finished socks from your books as well. Having modelled Saxifrage in Coop Knits Socks, I loved seeing this beautiful pair by WriterGirl3. Gloriously raspberry Saxifrage socks from WriterGirl3. Jesse from A Knitted Sock Society, knitted by Nina90 using Rowan Fine Art Sock and Colinette Jitterbug. I've never knitted any colourwork socks, and these are stunning. They've persuaded me to give it a go! I don't know why, but I've always been a bit scared of colourwork socks. Something to do with getting the right tension I think. Do you have any top tips? These Fred and George socks knitted by mma are brilliant too… Too many choices!! Mma knitted these Fred and George socks using String Theory Hand Dyed Yarn Bluestocking. They look ace! I'm always on the lookout for great patterns for variegated yarns. I tend to play it safe and just knit plain socks if my yarn is a bit loud, but these Solar Flair socks knitted by Roobeedoo look fantastic in Hazel Knits Artisan Sock. The textured stitch pattern works brilliantly with the zingy yarn. Last year's Knitting Goddess sock club patterns had a Kevin Bacon theme, and JillRLambert finished off her Watzisname socks a few weeks ago, thus enabling her to enter them for Summer of Socks. I absolutely love your twisted stitch patterns - you have such a great eye for them! And last, but by no means least, John Huston, the Tarnished Hero has leapt up my queue thanks to this lovely pair knitted by NicoleS. NicoleS's lovely John Huston, the Tarnished Hero socks. I've had my eye on these for ages. They'd be a great pair to make for Jim for Christmas, and I have the perfect yarn in my stash… I'd better get knitting! I hope you're having a good summer, filled with lots of lovely socks. P.S. All photos are copyright of the knitters featured and are used with their kind permission. Thank you!